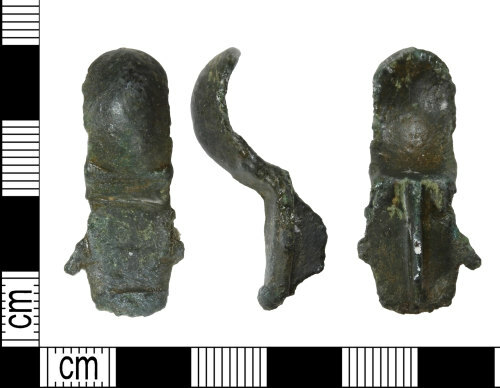 Early Medieval copper alloy brooch fragment, 34mm long 12mm wide and 4mm thick with a weight of 5.72g. The object is rectangular in form and cross section and forms the upper part of the bow of a cruciform or small long brooch and consists of one half which is plain and has a bowed form with a rounded upper surface. The second half is flat and rectangular with slight traces of probable lappets to each side. The reverse of this houses a centrally placed, sub rectangular catch plate.